Foreword by James Bosco, Professor Emeritus in Educational Studies at Western Michigan University. See Additional Files (below) to download the cover of AER 56 (.pdf format). AER 56 explores national and international policy priorities for building students' innovation capabilities through information and communication technologies (ICT) in Australian schools. Section 1 sets out the Australian policy context for digital education and highlights some of the emerging challenges. 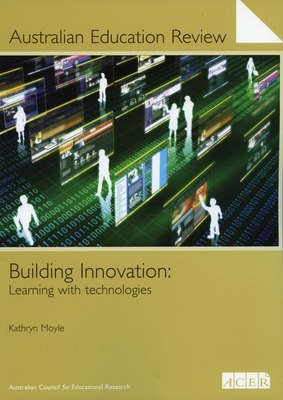 It provides an overview of two Australian school education policy priorities: that of how to meaningfully include technologies into teaching and learning; and how to build innovation capabilities in students. Section 2 critically examines the education and economic policy contexts for digital education in Australia, their intersections with international economic priorities, and the role of commercial technologies markets in schools. Section 3 discusses those Australian education policy priorities that focus on how students build both their discipline-based knowledge and general capabilities, such as creativity and innovation, using technologies. Section 4 provides some insights into how students currently use technologies for learning and communicating with each other inside and outside of school, and reflects upon what are the implications of these practices for students and policy implementation in schools. In Section 5 the discussion focuses on the physical and human characteristics required by all stakeholders to enable learning with technologies in 21st century schools. Section 6 challenges existing policy approaches to technology-use in schools, and argues for more open approaches to the deployment and use of technologies and digital resources in schools.